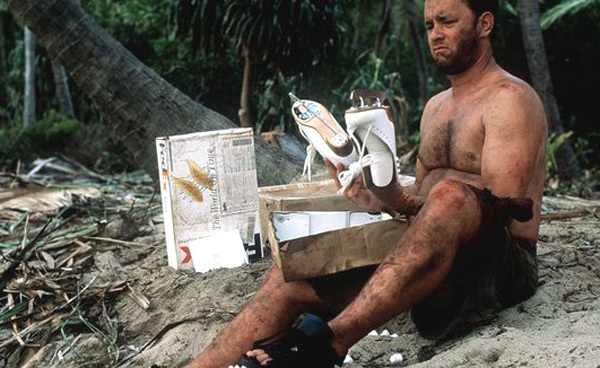 Chuck Noland (plump Tom Hanks), inextricably married to his time-sensitive, nerve-fraying job as FedEx consultant, instead of to quietly-suffering fiancé Kelly (Helen Hunt), finds himself suddenly and unceremoniously negated from Civilization’s jetstream when a plane crash leaves him Stranded On A Desert Island. 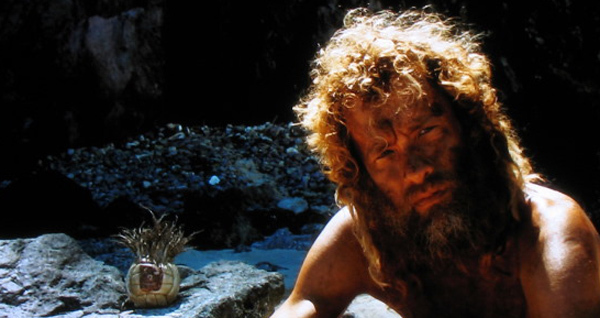 CAST AWAY seems to be nothing new: we’ve seen and heard it all before with Crusoe, the Robinsons, Thoreau’s elective isolation in Walden, BLUE LAGOON (1949 and 1980 versions), even Oliver Reed in a 1986 movie called, heh, CASTAWAY. 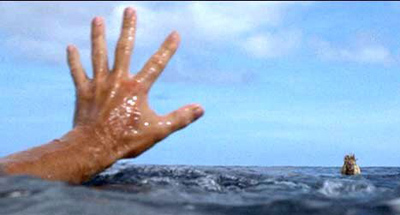 Why then is this CAST AWAY so absolutely compelling? In our arrogant, present day technophilia, we feel ourselves masters of the world; that Nature, once so forbidding, cannot scare us the way it did before we discovered fire and grocery stores and cell phones. But – like OPEN WATER or INTO THE WILD – CAST AWAY reminds us that Nature is still Master, that we are a hair’s breadth away from being overwhelmed by it; that knowing how to setup a HD TV is nowhere near as important as knowing how to start a fire with no matches. Writer William Broyles Jnr. and director Robert Zemeckis audaciously acknowledge their audience’s intelligence in making Chuck’s island interlude all the more powerful and poignant by what they leave OUT. Chuck crashes in his FedEx plane (in an incredibly realistic sequence), so a few parcels wash onshore that he ultimately utilizes; other than that, the filmmakers go to great lengths to make Chuck discover the basics of survival with a learning curve so slow we would not be criticized in questioning his mental aptitude. But he’s not retarded, he’s just modern. Minimal dialogue and no soundtrack; no computers, fridges, no undercurrent of electrical paraphernalia pulsating subliminally, no lawnmowers or leaf-blowers growling on faraway lawns, no iPods, piped muzak, TV commercials bombarding lies of “whitening whites” – a slice of heaven. If you can get past the small fact you may die a lonely death there. In one of the FedEx parcels, a volleyball, which soon attains a “face” made with Chuck’s own blood. 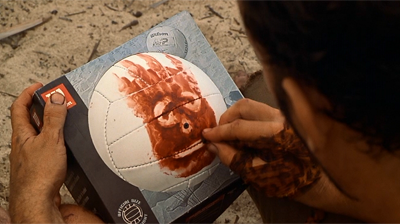 Naming the volleyball Wilson, Chuck attains the “human” companionship that stops him going completely nuts. And there is a certain elegance in Wilson being forged from Chuck’s blood; he is, in essence, part Chuck. To heighten the impact of Hanks actually looking the part of a man who has been marooned for years, Zemeckis and his crew took a year hiatus from this movie to make another movie – WHAT LIES BENEATH, a not-too-shabby thriller starring Harrison Ford and Michelle Pfeiffer – before returning to commit CAST AWAY’s second half to film. We meet Chuck “four years later” (a physically overhauled Hanks), now a sinewy hunter caveman, living on coconuts and crabs, and able to spear fish from twenty feet away without computerized targeting or iPad apps, which he devours raw and expressionlessly. Admit it – you cried over a volleyball. We all did. CAST AWAY is a perfect example of not needing extraneous elements to “add excitement” to what is an extremely interesting thought experiment. On the island, Chuck never encountered headhunters or villains trying to tie him to any railroad tracks – not needed; during Chuck’s raft escape, no sharks or Krakens. And yet, one event moves us more than any of that vaunted action-adventure possibly could. And heartbreak over inanimate objects took on a whole new meaning. For thematic closure, Chuck must necessarily escape back to First World indolence, in a fourth act where he finds he cannot reconcile his new Life-awareness with that of society’s stultifying rigors, nor can he rekindle the “love” which kept hope alive whilst marooned, enabling him to embrace a free-wheeling optimism, only evidenced in the film’s final moments… as he delivers a parcel emblazoned with angel wings back to the farm from whence it came; the only parcel he never opened on the island, for whatever mystical reason. Coconuts and crabs tonight, old son! Starring: Tom Hanks, Nick Searcy, Helen Hunt, Vince Martin, Christopher Kriesa, Chris Noth.